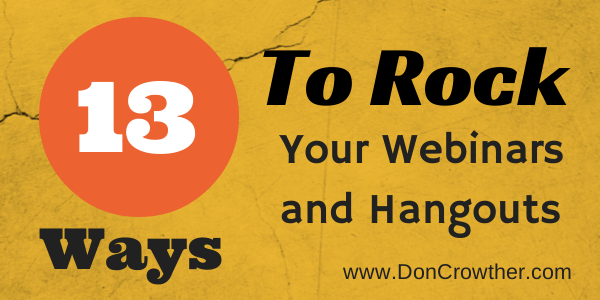 Thinking of doing a webinar / hangout but nervous that you won’t succeed? I can understand – in fact, even after doing literally hundreds of webinars, I always get a little bit nervous before starting each one – not only for the presentation itself, but that all the technical aspects will work out. After all, it is, in effect, live TV! Here are three tips, and a very nicely done infographic, to help you succeed. b. Be able to answer questions your audience asks during the webinar / hangout. When are you “ready enough?” When you find that your results, thoughts and/or insights are good enough to provide value to people who aren’t as experienced in the subject area as you. Webinars and hangouts bring with them technical issues made worse by the fact that you’re live in front of an audience. Most of the problems that may result can be minimized by practicing, in advance, with a couple of close friends on the line. To do that, schedule a separate webinar / hangout, invite a couple of friends, and practice, using the technology you will use during your broadcast. Webinars are not a place to “wing it.” Think of a webinar / hangout as a very important presentation before your best prospects and most loyal customers, because that’s exactly what it is! In other words, you want to knock it out of the park! So, make sure your information is rock solid, your presentation is polished, and your thoughts are clear. That’s going to take advance preparation, and yes, practice beforehand. Here’s a well-designed infographic talking about your presentation that’s well worth studying. What has been your experience with webinars and hangouts? What are you doing to make sure they’re successful? Share your thoughts by adding a comment below, and don’t forget to Like, +1, Tweet, and pin this post!